Free standing bulletin boards are a secure way of displaying information throughout your campus, business, or any public area. 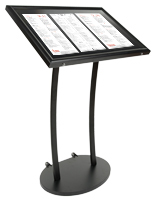 These enclosed bulletin boards with aluminum frames are offered in various sizes and configurations. 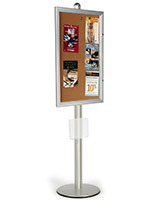 These free standing bulletin boards with locks are ideal for posting flyers, announcements and visuals while accentuating any interior. Place these message signs in a lobby to announce upcoming events. 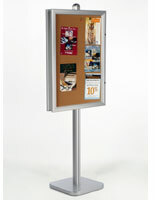 Such free standing bulletin boards, as the double-sided version, are best used in high traffic areas. Use these enclosed corkboards to allow the public to post want-ads or other community happenings. 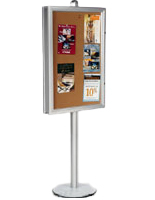 Buy lockable bulletin boards to display your business' advertisements, special offers, and sidewalk menus to entice customers passing by. 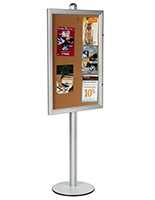 With a such a commanding height, these free standing bulletin boards are sure to capture the attention of all passersby. What features do these framed bulletin boards have? 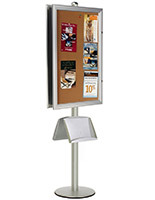 Free standing bulletin boards have metal material stands that allow you to place it in any location. 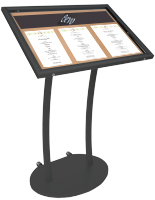 These message board stands with aluminum frames are ideal for indoor use. 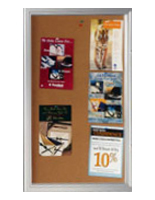 These enclosed bulletin boards come with single side and double sizes that can fit all your needs. 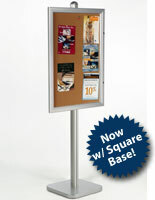 This enclosed framed bulletin board has a pocket attached to the frame that allows customers display their brochures. 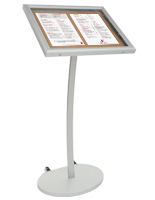 Floor standing bulletin boards are highly portable and can be moved to any spots according to customers' needs. 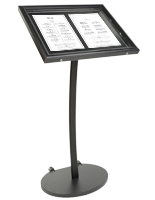 Unlike wall mount corkboards, this enclosed display cases doesn't have to be in one place. The portable bulletin board here is great for temporary message displaying. Double-sided cork boards are great for catching people from both side. The brochure pockets on the stands are convienient for both exhibitors and customers. 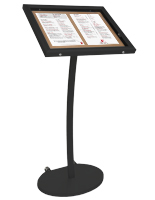 These outdoor message cases, also known as floor standing enclosed bulletin boards, include a durable aluminum frame with a weighted base for support. The enclosed case features two locks for added security. They use a swing hinge door to quickly change media. The display area is manufactured from cork. 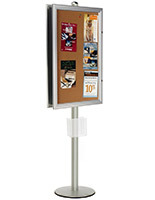 These lockable bulletin boards are adjustable up to 72" from the floor. These corkboard stands now feature either a square or round base. 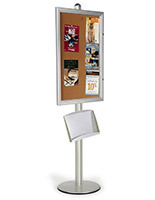 This line of floor standing lockable bulletin boards come ready to assemble with all necessary hardware, additional keys, and a set of thumb tacks. 8am - 8pm Eastern Time US. Our sales team is eager to assist in selling a smooth transaction or to respond any questions. Orders placed before 3PM will be shipped out same day.